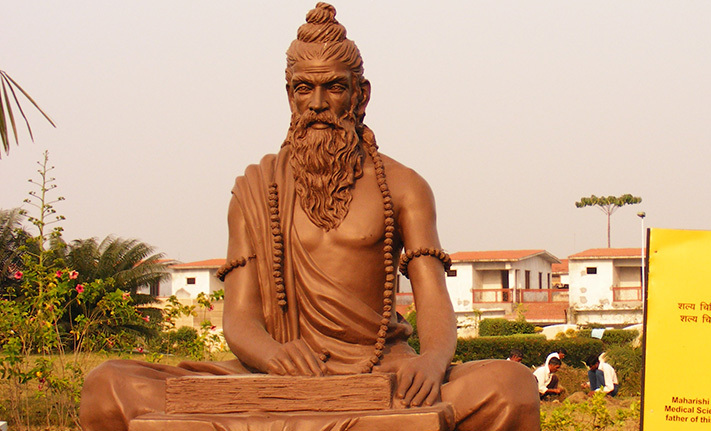 A statue of Sushruta Samhita in India, who wrote one of the founding texts of Ayurveda, an ancient, traditional Indian medicine dating back over 5,000 years. A workshop on Ayurveda is being offered at our Centre in May. Restoring health and harmony is the main purpose of this Ayurveda workshop in May, which will be taught by B.N. Kumar – a physician with close links to the home of Ashtanga Yoga in Mysore since 2001. The tradition of Ayurveda dates back to the 6th Century B.C. and teaches ways to keep our life free from ailments and problems. It teaches us not to interfere with our body by relying on external support. Physical bodies are composed of the gross elements, each of which has its own unique characteristics. When these elements are balanced and in harmony, the body is healthy. Through Ayurveda we learn ways to keep our life free from ailments and problems. It teaches us not to interfere with our body by relying on external support. Restoring health and harmony is the main purpose of this workshop. There will be plenty of opportunity for questions, and potentially addressing problems on the spot. Kumar was born into a traditional Brahmin family in 1967 in Mysore. The earliest influence in his life was that of his grandfather, the late Pundit Narasimha Murthy – a well-known Ayurvedic physician in Mysore. Kumar spent a lot of time with his grandfather, and received some of his earliest lessons in Ayurveda from him. His grandfather later renounced the world and became a monk of the Hindu order. Kumar first became known to students of Sri K Patthabi Jois in 1995, when he began giving them Ayurvedic treatments. At the time Guruji was still living and teaching in the Shala in Lakshmipuram (Mysore). Over the years, Kumar has befriended some of Guruji’s earliest Western students, and has many stories of these early days. Residing just a few doors from the current Shala , Kumar has been teaching aspects of Ayurveda to yoga students there since 2001. More on the Ashtanga Yoga Centre of Melbourne.